George Johnson was the younger son of two extraordinary people. 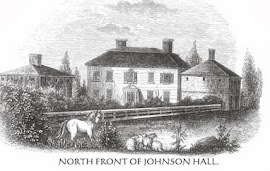 His father was Sir William Johnson, one of the richest, most powerful men in colonial New York. His mother was Molly Brant, stepdaughter of a Mohawk chief and older sister of Iroquois leader Joseph Brant. George spent his childhood in comfort and privilege, along with his older brother and six sisters at Johnson Hall, a place where Native American culture mingled easily with European customs. But the looming Revolutionary War turned this life upsidedown. After Sir William's death in 1774, Molly and Joseph Brant urge the Iroquois nations to support the Loyalists. George's older brother Peter went off to fight the rebel Americans, becoming an instant hero by accepting the capture of Ethan Allen. As rebel forces took over the Mohawk Valley, George and his family had to flee for their lives. After weeks of walking, they reached the safety of Fort Niagara. George was sent away to school in Montreal, where he spent three miserable years. 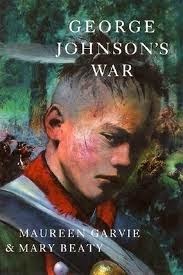 Finally, he persuaded his mother to allow him to join in a last raid on the valley where he had spent his early years. There he experienced first-hand the inglorious brutality of war, and struggled with what it meant to be half Mohawk. There too he at last learned the truth about his beloved older brother. At thirteen, George convinced his mother to let him join the King’s forces and fight to reclaim the valley where he had grown up. Discovering that this war pitted neighbor against neighbor, George also faced an inner struggle with his half-Mohawk heritage. I run two black fingers down my cheeks and smear the red in a band over my forehead. It’s bear grease and powder. It feels gummy, like blood, he muses. His captain pulls him back into reality, saying, "You swore your oath to the King!" Based on actual historical people and events, this book brings to life the reality of Revolutionary times. Taking the viewpoint of young George, young readers will sympathize with the plight of the Indians as their land is seized little by little. The story flows smoothly and the crisp dialogue makes the characters real. The authors have provided, at the back of the book, historical notes, a timeline, descriptions of the real people, and suggestions for further reading. Teen readers who enjoy learning about America’s early history will love this book (review by Linda Cooley, ForeWord).